Eurasian Sparrowhawks (Accipiter nisus) increasingly represent successful city-dwellers. Thereby, a rich food supply indicated by high numbers of small birds is believed to be the key driver for this bird-eating raptor species to settle in urban environments. However, as small passerine birds show particularly strong antipredator responses, sparrowhawks may not simply focus on patches of highest prey densities, but rather respond strategically to prey behavior, raising the importance of other parameters in determining the occurrence within urban landscapes. To deepen our knowledge on habitat requirements of urban sparrowhawks, bird surveys were carried out during winter between December 2005 and January 2017 in 36 city parks in Vienna, Austria. Besides food supply also park size, canopy heterogeneity and the connectivity with other green spaces were considered. Occurrence of sparrowhawks was positively affected by increasing park size, prey density and the interaction between both. Bird feeder density and park connectivity with other green spaces were of minor importance in explaining the presence of this species. Canopy heterogeneity didn’t affect city park occupancy by Eurasian Sparrowhawks. Our results suggest that large city parks, particularly when characterized by high prey densities, substantially contribute to protect and preserve ecologically important bird species such as raptors within the urban environment—a landscape already struggling with biodiversity losses and functional homogenization. While many raptor species are susceptible to human disturbance and habitat modification, hence avoiding urbanized areas, others have successfully colonized towns and cities during the last decades and are now increasingly associated with such strongly human-dominated areas (Kettel et al. 2018). Raptor species capable of utilizing urban habitats often benefit from their ample prey availability (Chace and Walsh 2006; Gahbauer et al. 2015; Lin et al. 2015; Suri et al. 2017; but compare Sumasgutner et al. 2014). In particular increased abundances of small mammalian human-commensals and passerines, both being attracted by artificial feeding opportunities, promote the occurrence of several falcons and Accipiter species in urban environments (Chace and Walsh 2006; Rutz 2008). Additionally, road traffic noise masks avian alarm calls, impeding the ability of passerine birds to perceive these critical signals (Templeton et al. 2016). As a consequence, hunting attempts of raptors may be more successful in noise-polluted urban environments. Further, birds of prey colonizing highly urbanized areas may benefit from reduced numbers of natural predators (Tella et al. 1996; Lin et al. 2015) and the buffering of urban environments against harsh weather conditions (“heat island effect”: Gartland 2011; Lin et al. 2015). Also the Eurasian Sparrowhawk (Accipiter nisus) is increasingly associated with towns, or even large cities and tends to become a successful city-dwelling bird (Newton 2010; Papp 2011). Sparrowhawks breeding in urban habitats can even have a higher reproductive success than those nesting in rural areas (Thornton et al. 2017). Sufficient food supply indicated by high numbers of small birds is believed to be the key resource when settling in urban habitats (Newton 2010). Hence, city parks with a rich food supply may be frequently occupied by sparrowhawks. This may be particularly important during winter, when large numbers of small passerines are attracted to bird feeders (Jokimäki and Suhonen 1998). However, prey species of sparrowhawks usually have particularly strong antipredator responses such as alarm or mobbing calls (Hogstad 1995; Forsman and Mönkkönen 2001). Hence, a warning call from just one individual is enough to make all the small birds flush to safe cover (Newton 2010). Additionally, the “many-eyes” effect of high density prey flocks increases the probability of a predator being detected and allowing the prey to escape in time (Pulliam 1973). As sparrowhawks are ambush hunters and rely on the moment of surprise during hunting, these efficient defense mechanisms of their prey may force the predator to adopt alternative hunting strategies than just focusing on prey density hotspots (Roth II and Lima 2007). Indeed, studies on bird-eating Sharp-shinned Hawks (Accipiter striatus) have already shown that hawks maintain spatial and temporal unpredictability in their movements instead of focusing on areas with high prey densities. Further, their hunting attempts proved more successful when attacking solitary feeding prey than prey foraging in groups (Roth II et al. 2006; Roth II and Lima 2007). In this study, we investigated if the occurrence of Eurasian Sparrowhawks in city parks simply follows classical concepts of foraging theory, with predators choosing patches of highest prey densities, or if this small raptor rather responds strategically to prey behavior, raising the importance of other parameters in predicting its occurrence within urban parks (Lima 2002). Hence, besides food supply also park size and the degree of canopy cover heterogeneity within city parks should be considered. The proportion of undisturbed core areas increases with park size (Fernández-Juricic 2001), facilitating the species to find suitable spots for plucking, roosting and resting—the main demands on its rural wintering habitats (Ortlieb 1995). As sparrowhawks are known to hunt extensively along forest edges (Götmark and Post 1996), a high degree of canopy heterogeneity may contribute substantially to the suitability of city parks as hunting grounds. Also the habitat surrounding city parks may affect the occurrence of Eurasian Sparrowhawks as a high number of green spaces in close vicinity to the city parks provide additional hunting grounds. 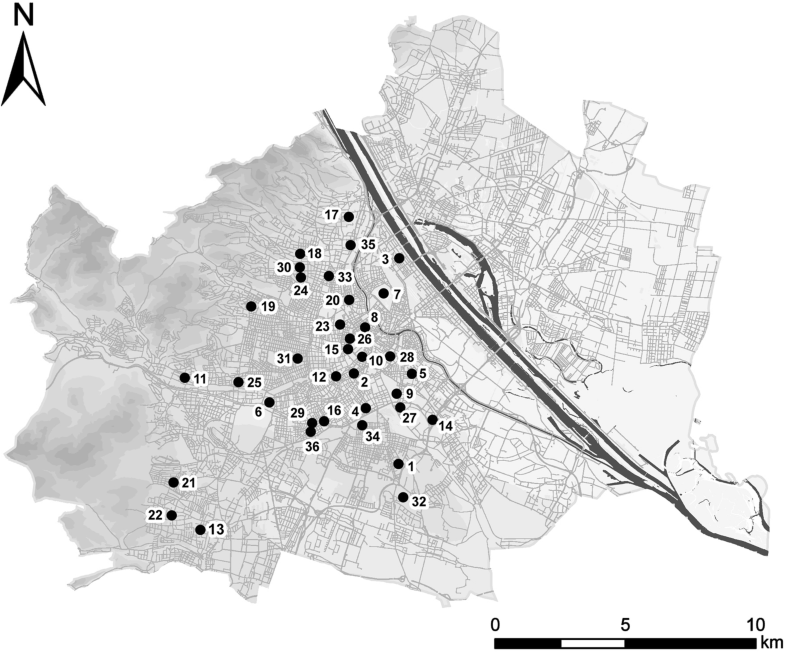 In contrast, in highly sealed urban areas the available habitat for passerine prey species may predominantly be confined to the urban park (Moudrá et al. 2018), possibly making it less attractive to the sparrowhawk, independent of its own suitability for this small raptor. The study was conducted in Vienna (48°13ʹN, 16°22ʹE), the capital of Austria, being inhabited by 1.9 million people and covering an area of 415 km2 (Statistics Austria 2017). We chose 36 urban parks with a mean area of 6.2 ha ranging from 0.36 to 34.48 ha, and spread across the city centre of Vienna (Fig. 1; Table 1). Between 2005 and 2017 each city park was visited nine times during winter months (December 2005, November 2008, January 2009, December 2009, December 2012, January 2013, December 2013, January 2015, January 2017). Bird surveys were carried out between 07:50 and 16:10 under favorable weather conditions, avoiding windy days and/or days of heavy rain or snowfall. Sampling effort was standardized according to park size (10 min per 1 ha). The existing network of paths and roads within a park was used for survey routes, trying to cover the entire area of the park in a zigzag-manner. Each bird species as well as the number of individuals per species heard or seen were recorded (except for over-flying birds), trying to avoid double-counts. Park area was calculated in ArcGIS 10.2 (ESRI) based on Vienna land use data of the year 2009 (City of Vienna 2018). The tree cover within each urban park was digitized in ArcGIS 10.2 (ESRI), using satellite images of the map service “ArcGIS Online basemaps” (0.3 m spatial resolution, date of origin: August 2011). Then, to attain the canopy heterogeneity within each city park, the perimeter of digitized canopy (m) was divided by the area of closed canopy (m2), defined as closed leaf cover tolerating gaps up to 5 m. Consequently, higher canopy heterogeneity values indicate a higher density of edges. For describing the connectivity of the 36 city parks in which bird surveys were carried out to other green spaces within the urban matrix, a network centrality measure was calculated (CAIDW). CAIDW considered the distance (by applying inverse distance weighting) and the area of green spaces each city park was connected to. For quantifying CAIDW not only the 36 city parks in which bird surveys were carried out were considered, but further 760 parks and other green spaces (meadows, lawns) using Vienna land use data of the year 2009 (City of Vienna 2018). High CAIDW-values indicate a high area weighted connectivity of a city park to other green spaces within the urban matrix (Table 1). To quantify food supply within each city park, only small Passeriformes weighing between 15 and 250 g were considered, as these birds are commonly preyed upon by Eurasian Sparrowhawks (Selås 1993). Information on weight for each species was extracted from the CRC handbook of avian body masses (Dunning 2008). To standardize prey availability for differences in park size, the mean number of small Passeriformes surveyed between November 2008 and January 2017 was divided by park area (measured in hectare). Furthermore, also the mean number of artificial food supplies per ha—as an indirect surrogate for prey density—was calculated. Therefore, in December 2013, January 2015 and January 2017 the number of food supplies such as bird feeders, bird fat balls and sites providing supplementary food on the ground were counted during field work. During the 324 (36 city parks × 9 surveys per park) bird surveys conducted only small numbers of sparrowhawks (min: 0, max: 2, mean ± standard deviation: 0.08 ± 0.31) could be observed. Hence, to avoid zero-inflated models (see below), we pooled the nine surveys and used binary (presence-absence) data as response variable for all further analyses. A city park was assigned “0” if no sparrowhawk could be observed during the nine surveys and “1” if the species could be observed at least in one of the nine surveys. To facilitate the interpretation of effect sizes, all predictor variables were mean centered and standardized [(raw value – mean)/standard deviation] prior to analyses (Schielzeth 2010). To test for effects of park area, canopy heterogeneity, CAIDW and density of prey and bird feeders on the occurrence of Eurasian Sparrowhawks, Generalized Linear Models (GLMs; with binomial error distribution and logit-link function) were carried out. 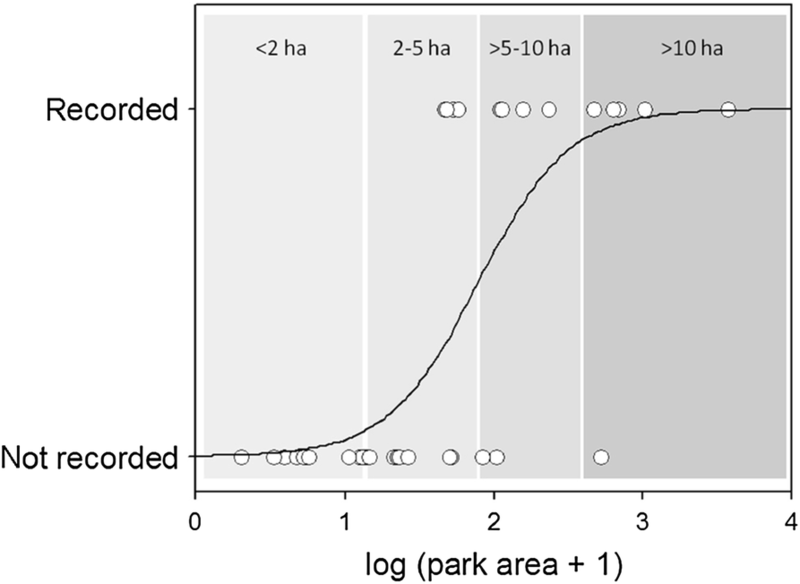 As the calculated Pearson correlation could indicate a very weak negative relationship between prey density and park size (r = − 0.289, p = 0.086), perhaps as edges of urban green spaces attract particular high numbers of birds [e.g. flocks of House Sparrows (Passer domesticus)] from adjacent highly sealed areas, we also included the interaction term prey density and park size in our models. In contrast, no relationship existed between prey density and feeder density (Pearson correlation: r = 0.058, p = 0.738). GLMs were ranked using Akaike’s information criterion corrected for small sample sizes (AICc) as the sample size divided by the number of parameters included in the models was < 40 (Symonds and Moussalli 2011). Only models that had an AICc difference (∆AICc) < 4 from the best model (= model with lowest AICc value) were included in the candidate set (Burnham et al. 2011). To minimize multi-collinearity models containing two or more strongly correlated predictor variables (r ≥ 0.4) were discarded from the candidate set. For these best ranked models Akaike weights (= the relative likelihood of the model being the best) were calculated. Furthermore, for each predictor variable included in the best ranked models its relative importance (= sum of Akaike weights over all the models in which the variable appears) was evaluated. Statistical analyses were carried out in R 3.0.3 (R Core Team 2014), using the R package glmulti (Calcagno 2013) and MuMIn (Barton 2016). As park size proved to be of prime importance for the occurrence of sparrowhawks in city parks (see results section), we finally calculated a logistic regression describing the likelihood of occurrence in relation to park size. Of the 36 city parks considered in this study, 14 parks were occupied by sparrowhawks, whereas the species was not observed in 22 parks. When testing for effects of city park characteristics on the occurrence of sparrowhawks, park size, prey density and the interaction term were included in all three best ranked models (Table 2). The null model was ranked 27th among the 47 candidate models. CAIDW and feeder density were of minor importance in explaining the probability of sparrowhawk occurrence (Tables 2, 3). Canopy heterogeneity wasn’t included in the best ranked models. Both, park area and prey density, and the interaction between these two explanatory variables proved to have a positive effect on sparrowhawk occurrence (Table 3). The 50% threshold for sparrowhawk occurrence in city parks described by a logistic regression (χ2 = 21.14, p < 0.001) was at a park size of ca. 5 ha (Fig. 2). While sparrowhawks were recorded in 71.4% of parks larger than 5 ha (n = 14), the species was only recorded in 18.2% of parks smaller than 5 ha (n = 22). According to our results, park size, prey density and the interaction term of both variables proved to be of major importance in explaining the winter occurrence of sparrowhawks in city parks. Larger parks showed a higher probability of park occupancy by this woodland raptor species than smaller ones. Woodlots embedded in an urban landscape generally experience higher levels of human disturbance compared to rural forests (Kang et al. 2015). Furthermore, in small patches negative effects of disturbance are increasing due to higher edge/area ratios and consequently the proportion of undisturbed core areas decreases (Fernández-Juricic 2000, 2001). Although Eurasian Sparrowhawks increasingly represent successful city-dwellers (Newton 2010; Papp 2011), they still show greater levels of fear towards the proximity of humans than do most passerine species (Møller 2012). Consequently, they still avoid nesting close to human habitation even in urban environments (Abe et al. 2007). Moreover, more aggressive nest defense behavior of female Eurasian Sparrowhawks towards approaching humans within urban habitats is indicative of higher stress level compared to rural conspecifics (Kunca and Yosef 2016). Human disturbance may also negatively affect habitat quality for sparrowhawks in winter, resulting in a preference for larger city parks. There this small woodland raptor has more opportunities to find undisturbed spots for roosting, plucking and resting, representing important habitat requisites (Ortlieb 1995). Higher prey density has already been suggested as a key factor for higher breeding success of Eurasian Sparrowhawks in urban than in rural environments (McGrady 1991; Thornton et al. 2017). During winter, urban areas may have a greater abundance of small birds due to the intense provisioning of supplementary food at bird feeders (Jokimäki and Suhonen 1998; Fuller et al. 2008). However, as it has already been found for the closely related Sharp-shinned Hawk, these predictable “prey hotspots” are not necessarily highly attractive for hunting sparrowhawks (Roth II and Lima 2007). This is also emphasized by our study. Although prey density was an important predictor for the occurrence of wintering Eurasian Sparrowhawks in city parks, feeder density was of minor importance. Small birds show highly effective defense mechanisms. Hence, just a tiny fraction of the birds that a hunting hawk encounters can be attacked with any chance of success, and even then potential prey usually detects the hawk in time to escape (Newton 2010). Additionally, Passerines in high densities, or aggregating close to bird feeders, benefit from a reduced predation risk due to foraging in flocks. Among others this reduced predation risk may arise from a reduced ability of the confused predator to single out and attack individual prey and increase the probability of the predator being detected (Sridhar et al. 2009). Consequently, to increase the proportion of successful hunting attempts Eurasian Sparrowhawks and other Accipiter species seem to select their prey rather on the basis of vulnerability than on abundance (Cresswell 1996; Götmark and Post 1996; Roth II et al. 2006, 2008). Thereby, solitary passerine birds foraging on the ground far from cover are easy prey for hunting Accipiter species (Cresswell 1996; Götmark and Post 1996; Roth II et al. 2006). The two predictor variables, prey density and feeder density, were not related. Hence, maybe habitat structures providing shelter and food for Passerines are more important. For example, small areas with a structurally diverse woody understory, e.g. consisting of shrubs developing fruits or berries with bird-dispersed seeds in winter, can be highly attractive patches in city parks for (at least partly) frugivorous songbirds (e.g. thrushes such as Blackbird Turdus merula, Fieldfare Turdus pilaris, Redwing Turdus iliacus; pers. observation). Measures improving the habitat structure of city parks can easily be implemented, thereby enhancing habitat quality for birds wintering (and breeding) in urban areas. As already shown for the Northern Goshawk (Accipiter gentilis), built-up areas can provide profitable hunting grounds (Rutz 2003, 2006). Hence, city parks surrounded by a low number of green spaces might not indicate limited access to suitable hunting grounds for Eurasian Sparrowhawks. As a consequence, the extent of green space connectivity only weakly influenced the occurrence of this species during winter in our study area. According to our results, the density of edges, facilitating the availability of perches along the margin of patches covered by trees, didn’t explain city park occupancy by Eurasian Sparrowhawks. In urban environments raptors not only perch in trees but increasingly use anthropogenic structures such as electricity pylons, TV aerials or buildings (Rutz 2003, 2006). Additionally, concealment during hunting can not only be achieved by using well-hidden perches. In the course of contour-hugging flights Accipiter species fly fast and low above the ground, even using habitat structures such as cars and fences as visual obstructions (Rutz 2006; Newton 2010). Predatory birds can be crucial for maintaining ecosystem functions (Sekercioglu 2006). Hence, promoting and preserving this functional group should be of high conservation concern especially within the urban landscape, already heavily suffering from functional homogenization (McKinney 2006; Devictor et al. 2007). Several studies have already demonstrated the high ecological value of large city parks to promote and preserve avian biodiversity within urban landscapes (Nielsen et al. 2014; Kang et al. 2015; Schütz and Schulze 2015). Also the results of our study on the Eurasian Sparrowhawk underline the importance of large semi-natural habitat fragments embedded in a human-dominated landscape. However, sparrowhawk occurrence was not only positively related to park size, but was also positively affected by prey density and even more strongly by the interaction between both variables. Hence, it is not only important to maintain large green spaces within urban areas but also to maintain park structures with high density of passerines. Both authors conceived and designed the study, carried out bird surveys and analyzed the data (CS: model selection, CHS: logistic regression). CS drafted the manuscript. Both authors read and approved the final manuscript. Vienna land use data was provided by the local government units MA 18, MA 21A, MA 21B and MA 41. Furthermore, we are grateful to many students who assisted in surveying city parks during field courses, among them are (in alphabetical order) Heinrich Frötscher, Franz Hölzl, Christoph Kaula, Bea Maas, Yoko Muraoka, Bernhard Paces, Benjamin Seaman, Bernadette Strohmaier, Michael Tiefenbach and Gábor Wichmann. We also thank two anonymous reviewers who offered valuable input on earlier versions of this manuscript. Barton K. MuMIn: Multi-Model Inference R package version 1.13.4. 2016. http://CRAN.R-project.org/package=MuMIn. Accessed 16 April 2018. Calcagno V. Glmulti: Model selection and multimodel inference made easy R package version 1.0.7. 2013. http://CRAN.R-project.org/package = glmulti. Accessed 16 April 2018. City of Vienna. Vienna GIS. 2018. http://www.wien.gv.at/viennagis. Accessed 16 April 2018. R Core Team. R: a language and environment for statistical computing. 2014. http://www.R-project.org. Accessed 16 April 2018. Statistics Austria. The federal provinces. 2017. http://www.statistik.at/web_en/classifications/regional_breakdown/federal_provinces_laender/index.html. Accessed 16 April 2018.